Since the passing of the draconian emergency law criminalizing massive demonstrations and assemblies, the Quebec Student Strike has gained popular support from the general population. 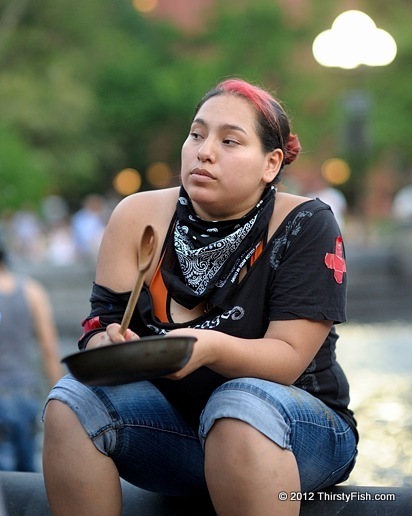 Cacerolazo, creating noise by banging pots, pans, and other utensils, is a form of protest which first began in Chile in 1971, and spread to Argentina and Uruguay in the 1970's. It is an effective form of nonviolent protest that attracts a high level of participation with people taking part from their windows and balconies. In Quebec, cacerolazos have been held nightly in towns and cities across the province since May 22. The Casserole Symphony is becoming global. This photo was taken at an Occupy Wall Street event, just before activists took to the streets of New York. Many other cities across the globe are beginning to hold nightly cacerolazos.